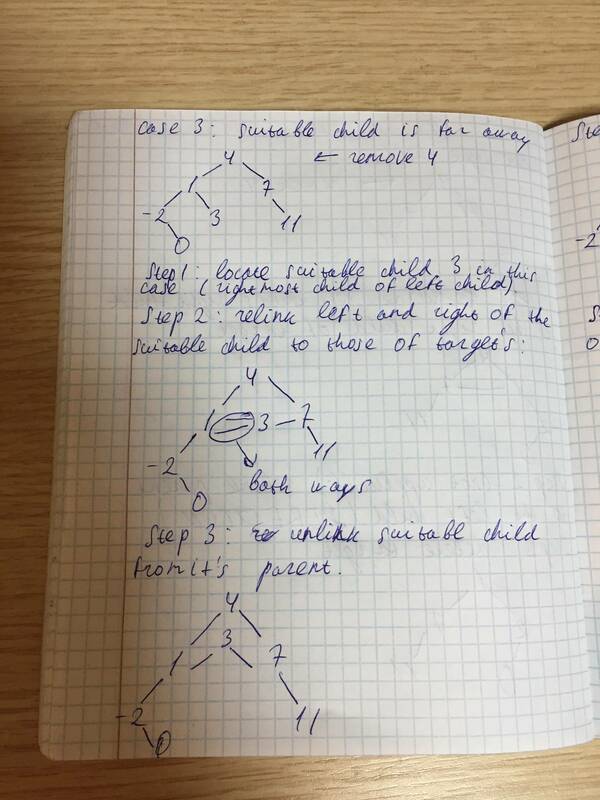 This is yet another data structure I'm going over again for the algorithms course. 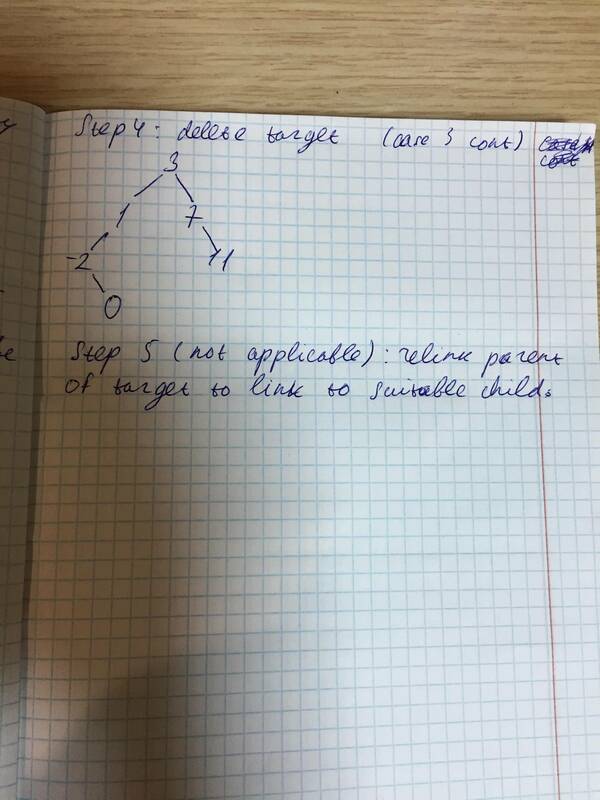 This time it is binary search tree. There are some tests for remove function below the data structure itself. I tested other functions, but the tests got overridden in the interim. They did pass though. I believe automated ones are not possible until I make the tree somehow traversable, but that's adventure for another time. The 4 case functions (nullptr, equal, less, greater) share the same control flow statements. I believe abstracting that away would make it worse though. This one took around an hour of my time to get correct, from starting to write it to debugging the three cases I found and tested for. It just gives that feeling. Or may be most of the algorithms I've seen are much more elegant than this. I believe the implementation guidelines are very important, so I decided to keep them here, as the safest place to keep notes for me is SE posts (I know it is quite weird). I included pictures for remove, as it is not as straightforward as others (pictures go over the same examples as in the code). Quite easy. Launch a recursion. If the current node is nullptr, insert at this node and return true (keep in mind that all pointers are passed by reference, thus the change will be reflected in the data structure itself. Also they always exist, no dangling references). If the value to-be-inserted is less than value in the node (IN THIS ORDER! ), search right location to insert in the left subtree. If greater, search the location in the right subtree. If the value is equal, then return false. Almost the same like insertion, but the true/false cases are reversed. If value is equal to the value in the node, return true. If node is nullptr, return true (nowhere else to search). Easy case. Relink parent of the to-be-removed node to the right child of the to-be-removed node (keep in mind DIRECTION!). Delete the to-be-removed node. Don't forget to update root if the to-be-removed node is root. Somewhat easy too. 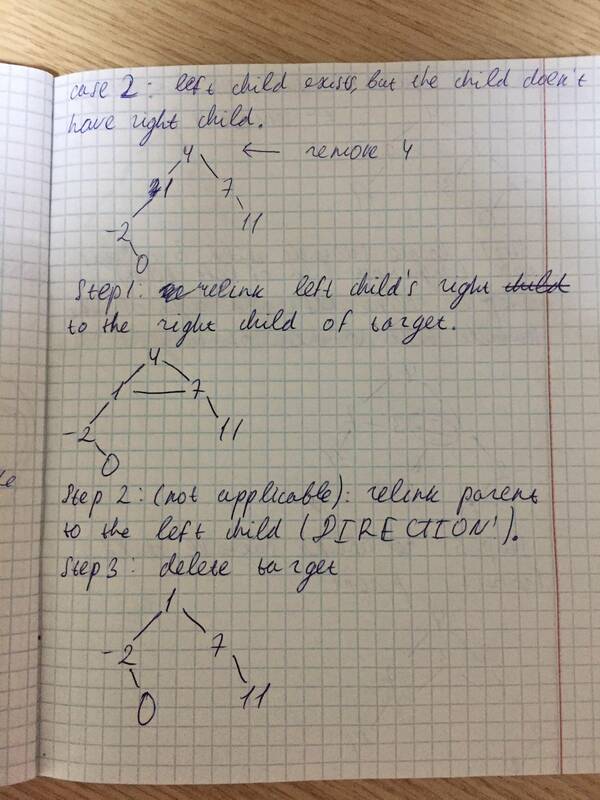 Relink parent to the suitable child, change the right child of suitable child to the right child of to-be-removed node. Delete to-be-removed node. Update root if it is affected. Find the rightmost child of the left child of to-be-removed node. Make sure the parent of the suitable child is no longer linked to the suitable child. Relink parent of the to-be-removed node to the suitable child. Relink left and right of the to-be-removed node the left and right of the suitable child, respectively. Delete to-be-removed node. If current node is nullptr, return. Go to the left, then to the right. Finally delete the current node. The first of your problems, namely code duplication is stemmed from the wrong interface. exists_helper returning a boolean violates a very important (and unfortunately little known) principle: do not throw away the information you computed. In case of exists_helper computed is an insertion point for the value you did not find. Returning that makes insert_helper, and the find, and delete thin wrappers around exists_helper. Along the same line, insert shall return an indication of success/failure along with the node itself, STL style. It doesn't really matter in case of integers, but for more complex ValueType we are usually interested in what did prevent insertion. I don't approve recursive nature of exists and insert. They are tail recursive, and better be written as iterative. Note that your case 2 doesn't need to be special cased: left child itself is the rightmost descendant. then your default constructor will be generated automatically. Last time I implemented a type of binary tree (the outer layer of a “T Tree”, with auto-balancing inserts and deletes) I took advantage of the symmetry between left and right to not write all the code twice. Instead of separately named left and right child nodes, I made an array of 2 children, so I have child and child. All the logic that deals with left vs. right is mirrored with the key less vs greater. So I implement it once using the abstract S and D instead of Left and Right, and switch which is which in the key comparison. That is, on the less-than case, S is left and D is right; on the greater-than case, the other way around. Since their values are 0 and 1, the conditional code just sets S and then D is always 1-S. child[S] will be either left or right, depending on the choice. Follow me? Although, it is the balancing code that is most of the work (and this eliminated many test cases too since it was all the same). If you do AVL tree or the like next, keep that in mind! parent_to_child is unusual. It means you need the follow-up switch statement in delete_if_exists and the extra state in direction (or maybe the whole enum at all, in your case). 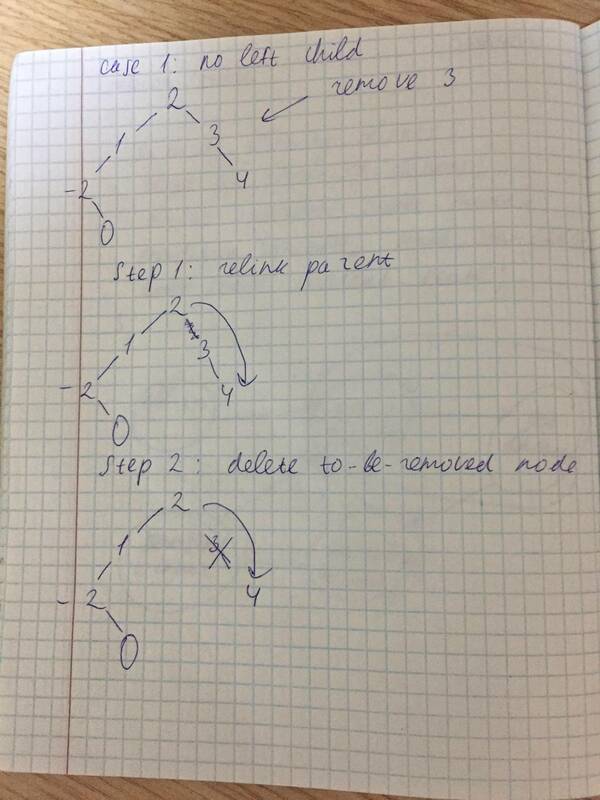 I think it is more normal to return a pointer to the parent as well as a pointer to the found node (if any). That also works when you do not have a parent pointer in each node (the purest form of binary tree does not). Don’t compare directly against nullptr. Use the contextual conversion to bool as a truth value that is meant for this purpose. This is especially when you start using smart pointers, as they implement an efficient operator bool rather than needing to do a comparison directly. Not the answer you're looking for? Browse other questions tagged c++ tree c++17 or ask your own question.